Greetings! The day is finally here! Exclamation! 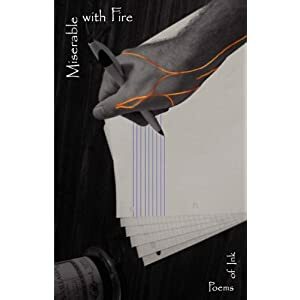 The paperback version of Miserable with Fire is now available for purchase online at amazon.com for $10.00 and Barnes&Noble.com for $6.47. If you catch me at a reading, I’ll sell it to you for $5.00. Check out the book’s page on inksblot.com for a little back-story and some samples and then order away! An eBook version is coming soon. Also, I’d like to thank the editors of Shot Glass Journal for publishing “a poem starting with a Louise Gluck line,” which is in Miserable with Fire! Go there and check out all the wonderful poems of the new issue.